Monday date night last week led us to a restaurant just minutes from our house, yet neither my boyfriend (FG) or I had been there before. The list of drinks and food on offer all looked appealing and appetizing, and the decor of the bar area was inviting and warm when we entered. We decided to sit at the CraftBar which is separate from the restaurant itself and has a different food menu, but we decided to mix and match and got a few bar menu items and then our entree from the regular restaurant menu. FG informed me that the “Craft” team pay a purveyor a lot of money just to travel the country in search of the best produce for all three of their locations. Only the best, organic, fresh and seasonal products are used so the menu changes constantly with what is and isn’t available. I started the night off with the ‘Front porch’ drink after our bartender (Scott) pointed out that peaches were at their best right now. 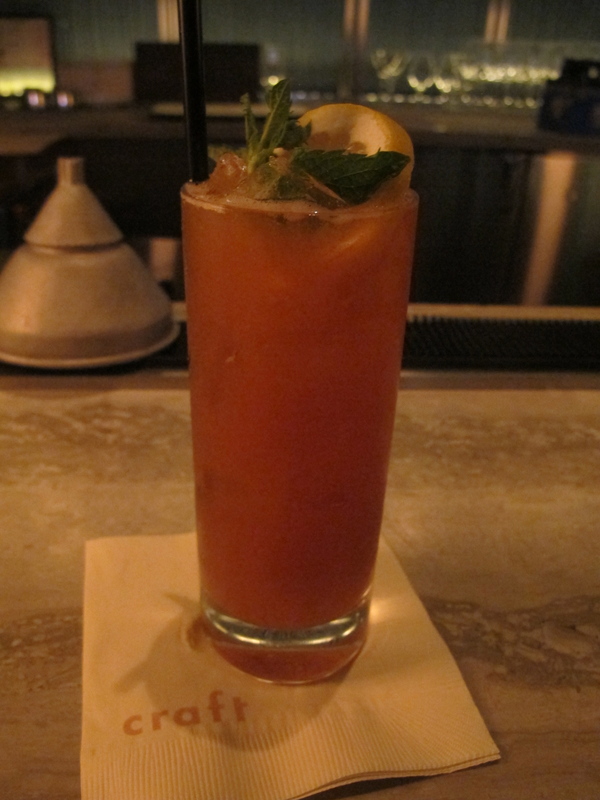 It was wonderful, like a deliciously peachy ice tea with bourbon! It was sweet, strong and fruity. 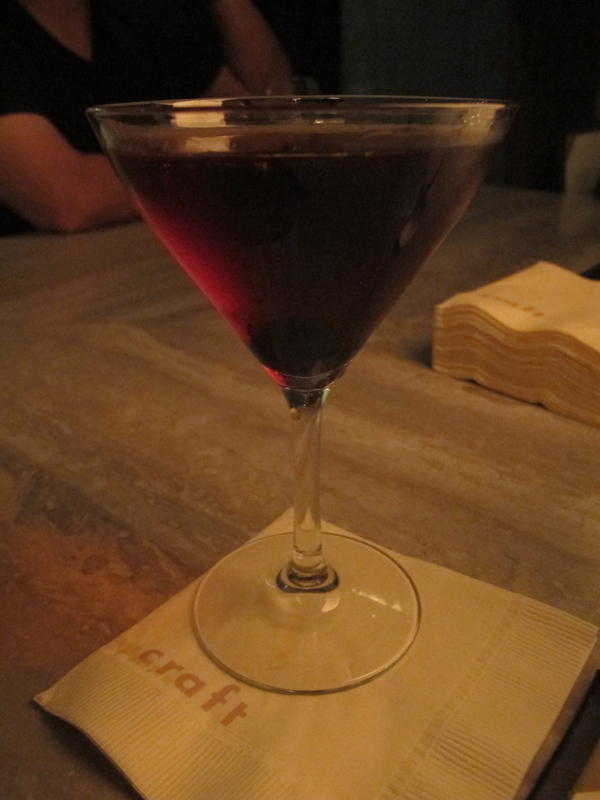 FG had the ‘Here today… gone amaro’ which was just as tasty as the name was imaginative! FG best described it as a Manhattan with a subtle sweet bitterness at the end. Rabarbaro Zuca is an amaro made with Rhubarb, which I have only seen on a menu once before, ironically in my boyfriends drink ‘Maguey after Amaro’. I like it when places use unusual ingredients though. FG was intrigued by the number of Amari they had on the back bar, including the Cio Ciaro (he’d never heard of) which he sampled and described as having a burnt caramel flavor with a slow bitter finish. Craft also makes a home made velvet falernum which was delicious, sweet and zesty. FG’s second drink was the Negroni Mio, this was a good drink, but not great. 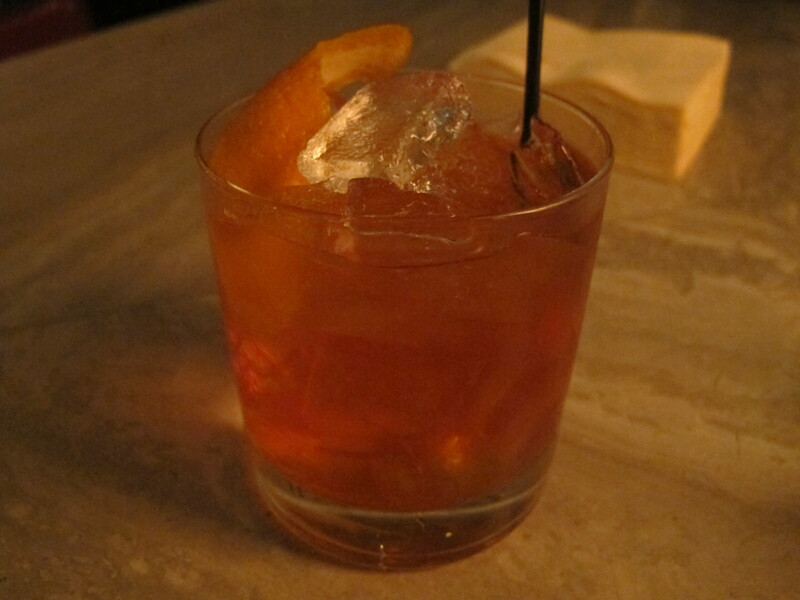 It sounded amazing on paper (they barrel aged the Negroni then bottle age it with strawberries), but the flavors really came through as simply a Negroni with aperol. 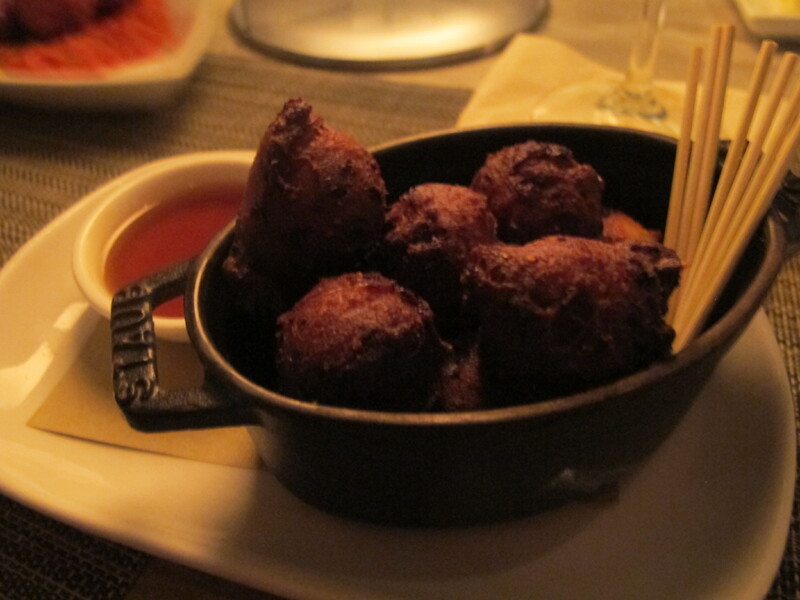 Many of the food options looked interesting but we started with the cheddar hush puppies that came with a smoked maple syrup to dip in. Delicious maple flavor from the sauce altho the puppies had little spicy kick to them. The cheese didn’t come through for me but still the dish was very tasty. 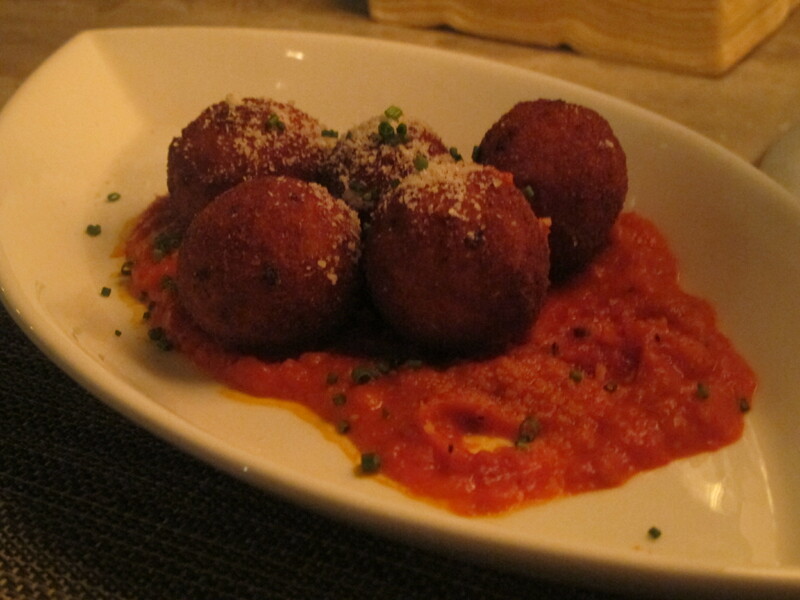 The risotto balls were also on the spicy side with a marinara type sauce named romesco, the crispy thin layer on the outside of each ball made them not too rich and another good starter dish. They also brought a bread basket out with delicious breads in. The dark loaf was incredibly different and hearty. In fact Scott gave us an extra loaf to take home, as he informed me it is the perfect bread to make french toast with the next day. 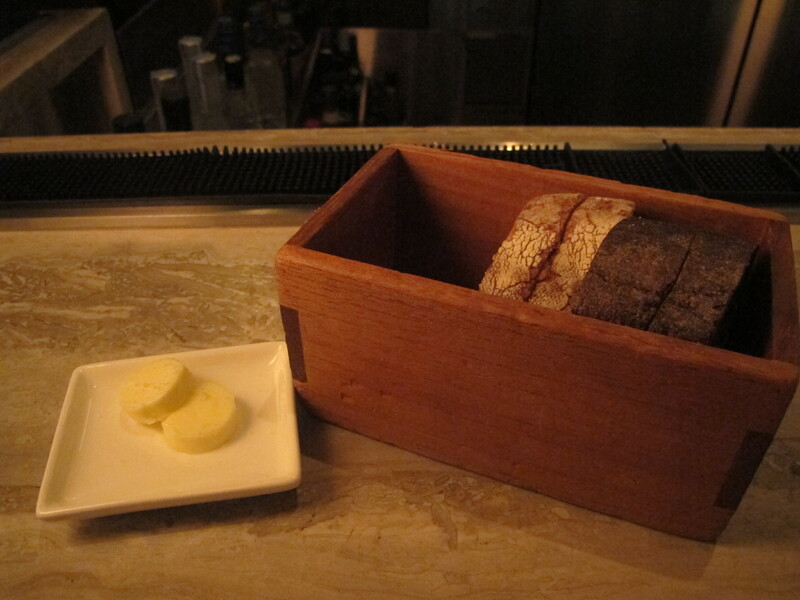 I loved the wooden box the bread came in too, the presentation of all the dishes was exquisite and although this was a slightly more expensive place than we’d usually go just for monday date night, it became clear very quickly why they deserved to charge so much. For our main course we agreed on a steak (like always!) and decided to share the dry aged sirloin. When it arrived I realized just how incredibly large 22 ounces of meat is and worried we’d way over ordered! We also chose some sides, the sugar snap peas (which i’m really in to recently, so sweet and crunchy) and the yukon puree. I had wanted a potato but couldn’t decide what kind, Scott had said these were “deliciously decadent.” Of course, alarm bells should go off when you hear a server/bartender describe something as decadent…it usually means, extremely fatty and high in calories. We didn’t care though, it was an indulgent night. The potato was certainly nothing less than decadent! Creamy, rich and full of flavor. 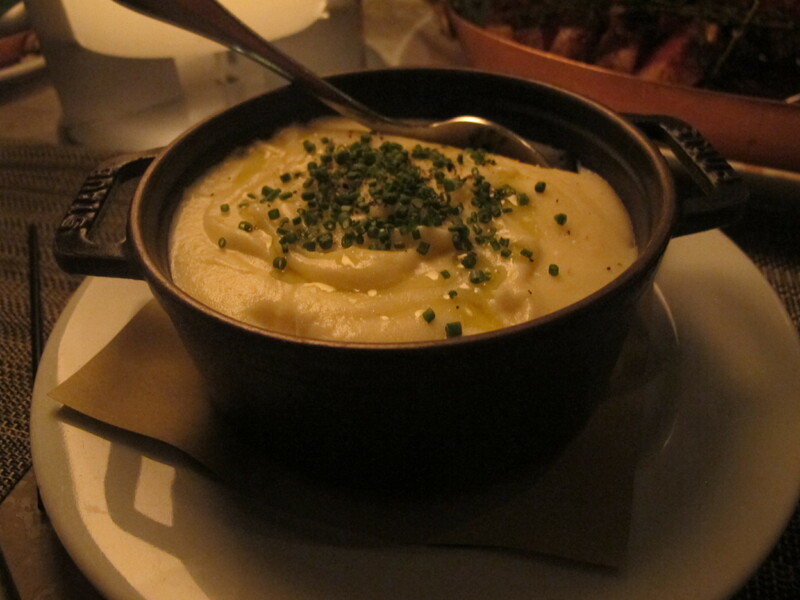 It was like a very soft buttery mash but still had a lightness to it, I couldn’t eat too much but it paired beautifully with the earthy flavor of the steak. I’m not sure i’d had dry aged beef before but it gave the meat a much stronger fuller flavor. 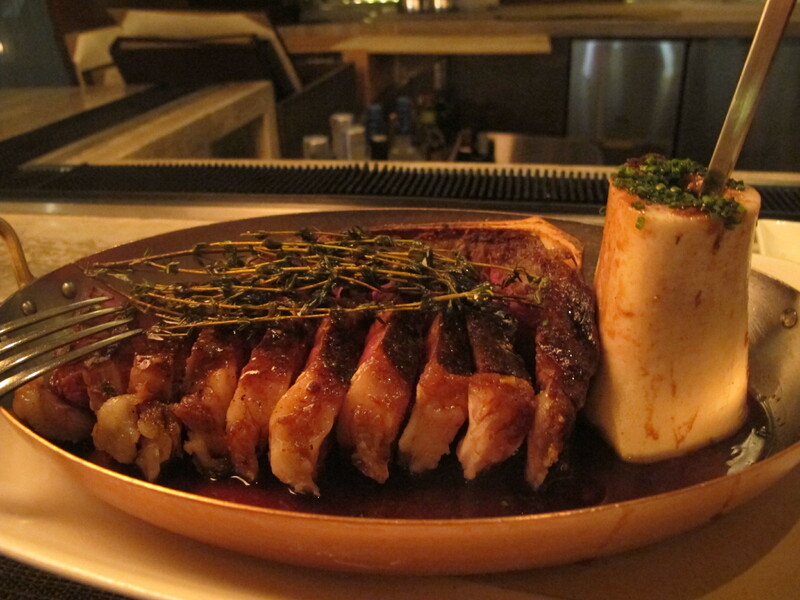 The meat came with a bone marrow on the side, which greg emptied out on to a piece of remaining bread. I think bone marrow is definitely an acquired taste, it reminded me of chicken dripping my mum would keep to put on sandwiches after a roast dinner. Not that it tasted like chicken, it just had a very greasy and fatty texture that reminded me of that. I didn’t like it at all, Greg devoured the whole bone full. To finish we saw the wonderful dessert list but felt too full to get anything (believe it or not, we had at this point eaten the entire steak and sides!!!). 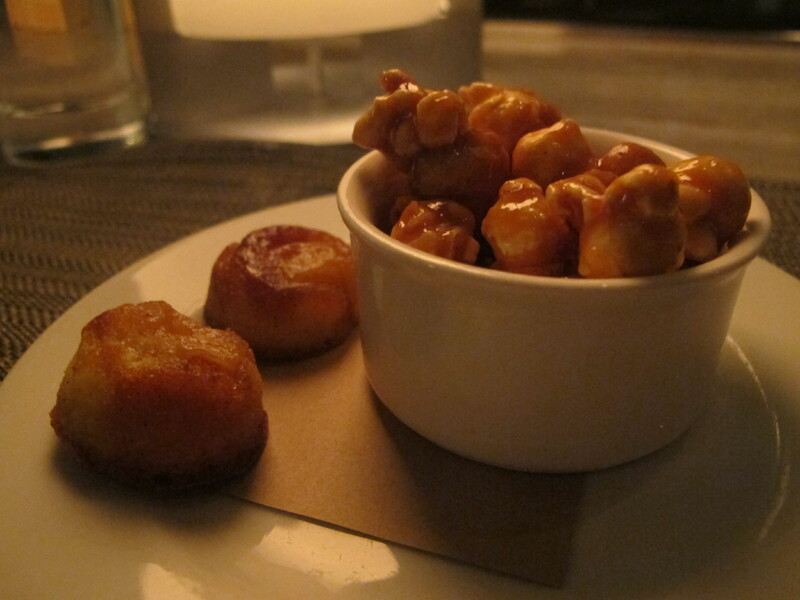 Scott brought us some little bites from the pastry chef which included some caramel popcorn and little nectarine upside down cakes. They were the perfect touch of sweetness to end the evening. Before we left Scott gave us a little pack of complimentary Craft Granola for the next day. FGs parents went the following week and were given some complimentary Craft muffins, it changes daily what you’ll get but I think it’s such a cute and unique idea to give something like that for breakfast. When we ate the granola the next morning (which was great) it had us remembering our wonderful evening the night previous. Very smart marketing move! Drinks here get my rating of 4 out of 5 Clover Clubs. My peach cocktail was fantastic, and FG certainly enjoyed his two drinks also. 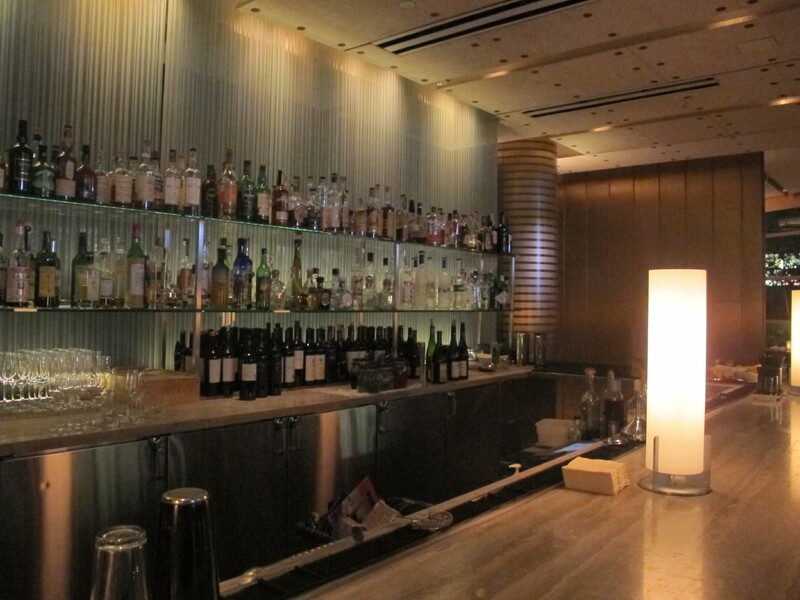 Scott was professional and informative behind the bar, and the look of the place was welcoming and attractive. The only negative of the drinks was the Negroni Mio that wasn’t as flavorful as the ingredients suggested, overall it was a close to excellent bar program. They also had an extensive wine list, for those not as excited by cocktails! Overall this place had it all, relaxing music, a nice chill vibe and excellent professional service. The food was fantastic, it was different and adventurous without being too overwhelming for a fussy person like myself. The only negative, which i’m not even sure is fair to give, was the high prices of this place. I hadn’t expected it to be on the higher end, having said that it really was worth the extra expense. The service really was amazing, and my boyfriends parents decided to go a few days later and had the exact same reaction. For that reason, this is the first place i’m giving 5 out of 5. 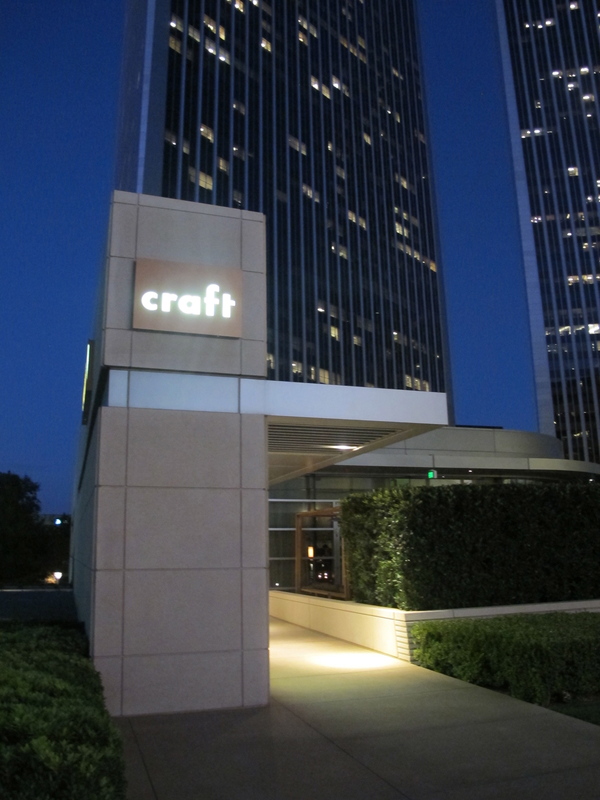 Watch out Bottega Louie (our most popular location), Craft may soon take over as our favorite place to go for dinner in LA! All in all, Craft (and Craft Bar) are an excellent night out. I highly recommend anyone looking for a romantic, quality restaurant in Los Angeles to head there.